The Farmhouse in Cheltenham, Glos sleeps 16 people. 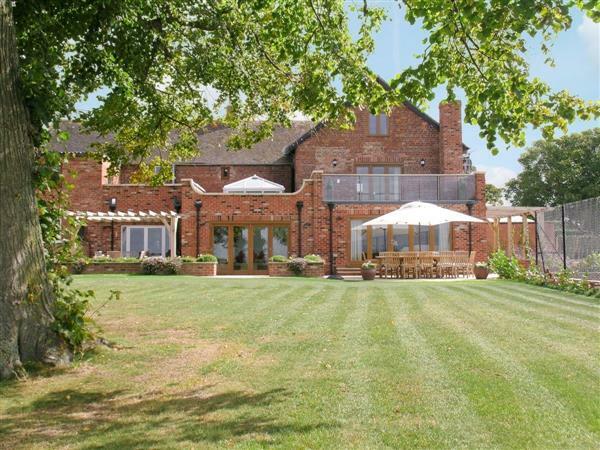 The Farmhouse occupies a superb position on the outskirts of Regency Cheltenham. With views across to the Malvern Hills and the Black Mountains beyond, this 19th-century farmhouse has undergone major refurbishment to offer guests a beautifully appointed, well-equipped home with an extensive lawned garden. With plenty of living space, six out of the eight bedrooms having en-suite facilities, the rolling lawns and a private hot tub, the Farmhouse adjoins another property and is an ideal location for a holiday or as a venue to celebrate a special occasion. This is a perfect base from which to explore the countryside and villages of the Cotswolds and the attractions of the Heart of England. Broadway – the ‘Venice’ of the Cotswolds; delightful Chipping Campden; Blockley, cited as the most beautiful village in England, and Stow-on-the-Wold boasting England’s oldest pub, are all within half an hour’s drive. Exploring this region at any time of year is a rewarding experience, each season throwing a different light on the changing scene. Heritage attractions include Sudeley Castle (7 miles). The Forest of Dean is 23 miles. Bath, Oxford and Stratford-upon-Avon are all within one hour by car. Sailing and wind-surfing on 15,000 acres of lakes near the Roman town of Cirencester are within 30 minutes’ drive. Well situated for Cheltenham race course. Shop and pub ½ mile. Large living room with wood-burning stove and large bi-fold doors to spacious terrace with eating area. Spacious dining/sitting room with wood-burning stove. Each with wooden floor. Two steps up to well-equipped kitchen with Aga (for cooking), breakfast area, tiled floor. Conservatory. Orangery. Separate toilet. West wing: Twin bedroom with TV and en-suite shower room with toilet. First floor: Double bedroom with TV, bi-fold doors to terrace with furniture and views, and en-suite bathroom with separate shower cubicle and toilet, leading to twin bedroom. Twin bedroom (zip and link beds) with TV and en-suite shower room with toilet. Second floor: Double bedroom with 6ft bed (zip and link bed). Bathroom with separate shower cubicle and toilet. East wing: First floor: Double bedroom with 6ft bed (zip and link bed), TV, dressing room and en-suite shower room with toilet. Double bedroom with 6ft bed (zip and link bed), TV and en-suite bathroom with over-bath shower and toilet. Double bedroom with TV and en-suite bathroom with separate shower cubicle and toilet. For a better idea of where The Farmhouse is, you can see The Farmhouse on the map below. The Farmhouse is in Gloucestershire; should you be on the lookout for a special offer, you can find all the special offers in Gloucestershire. It's always worth checking to see what is on offer at the moment. Do you want to holiday near The Farmhouse (NPQ), you can see other cottages within 25 miles of The Farmhouse; have a look to find your perfect holiday location.